Bracket play at the USA Basketball 2018 U.S. Open Basketball Championships took place Saturday at the Pacer Athletic Center in in Westfield, Indiana, and only a select few teams remain in the hunt for the prestigious championships title. The inaugural U.S. Open Basketball Championships, which featured 72 teams from 25 states and Canada, concludes Sunday with boys and girls eighth grade, 13U and 12U champions crowned. One of Saturday’s most exciting games took place in the boys eighth grade division and MBA Hoops from Mississippi, defeated defending USA Basketball 14U champion 757 Elite 63-62 thanks to a pair of free throws by Corinthius Jackson with 1.1 seconds left in the game. “Well with the game on the line I just had to come through for my team and just finish hard and finish strong,” said 15 year old Jackson. Jackson, who cleanly swished both free throws, said he wasn’t nervous, he was only concerned with helping his team stay alive and advance to the semifinals. Advancing to a showdown against 6-0 Arkansas Woodz Elite in Sunday’s semifinal, Jackson believes the final comes down to one thing. MBA Hoops coach Lonnie Dixon wasn’t surprised by his player’s calmness in a pressure-packed ending. “Corey Jackson, the young man is from Canton, Mississippi, and my hat is off to him, he did a spectacular job,” said Dixon. “There’s not too many eighth graders in the country that can go to the foul line in a big stage like this, where the crowd is going wild, and the young man just stepped up, he was just poised and man he just knocked it down and came through for the team. “It was a tough, grimy game. My hats off to the other team and their coaches, they stayed with it. We gave them a punch, they gave us a punch back, but hey, we had the final punch and we pulled it out,” added Dixon. And Like Jackson, Dixon believes his team can achieve more, much more. “We came here with one goal and that’s to take it all. We don’t want third place, we don’t runner-up, we don’t any of that, we want it all. So as coaches, we’re going to put them in the best position to win the game and that’s to just play together, leave it all out on the court and play with your heart. Every time you play with your heart good results happen. The final four of the boys eighth grade Stars Division is known, and Arkansas Woodz Elite (6-0) will meet MBA Hoops (5-1) in one semifinal, while 24/7 Select (5-1) will face Indiana Rise 2022 (5-0) in the other semifinal. Both semifinals tip at 9:45 a.m. EDT, with the winners advancing to the CBS Sports Network televised gold medal game at 2 p.m. EDT. In Saturday’s quarterfinal action, in addition to MBA Hoops punching its ticket into the semis after nipping 757 Elite in their quarterfinals clash, Woodz Elite eliminated previously undefeated Reading KTP 66-53; 24/7 Select edged Nova Suns 69-65, and Indiana Rise (5-0) remained undefeated after rolling over Next Page Force (4-2) 78-54. In the eighth grade Stripes Division, NWA Hoops (4-2) won both of its games Saturday to advance to one semifinal and will take on Maryland Sharks (3-3), while Hoop Avenue Elite (3-3) will square off against Mac Irvin Fire (3-2) in the second semifinal. Both semifinals tip at 9:45 a.m. EDT and the championship game will be played at 12:15 p.m.
Double-figure wins ruled the day for the eighth grade Stripe Division quarterfinal games. NWA Hoops (4-2) pounded Lakeshore Force 69-33, Maryland Sharks (3-3) defeated Willpower 2022 45-35, Hoop Avenue Elite scored a 68-18 win over EP Hoop Dreams and Mac Irvin Fire burned Illinois Predators 62-47. In Sunday’s boys eighth grade consolation championship contest, Untapped Performance (1-4) goes against Primetime Performance (3-3) in an 8:30 a.m. EDT game. The final four for the girls eighth grade Stars Division is also set. Undefeated All-Southern Starz (4-0) will play DFW Future (4-1) and New Mexico Elite (4-0) is set to take on CAL Storm (4-1). Both semifinals tip at 9:45 a.m. EDT, and the winners advance to the gold medal contest that will be broadcast by CBS Sports Network at 12 p.m. EDT. 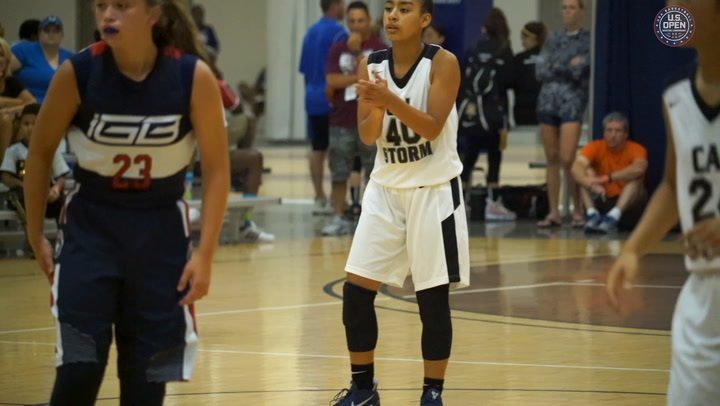 In the day’s play-in games, DFW Future beat Indiana Girls Basketball Morse 53-43, and CAL Storm kept its Stripes’ title shot alive with a 70-54 win over Spiece. The girls eighth grade Stripes Division championship game is down to Indiana Red Storm (1-4), 52-35 winners over Wisconsin Shooters in one semifinal, and Exodus NYC (2-3), 82-38 winners over DD Elite in the other semifinal. Tip-off for the eighth grade Stripe Division title game is 11 a.m. 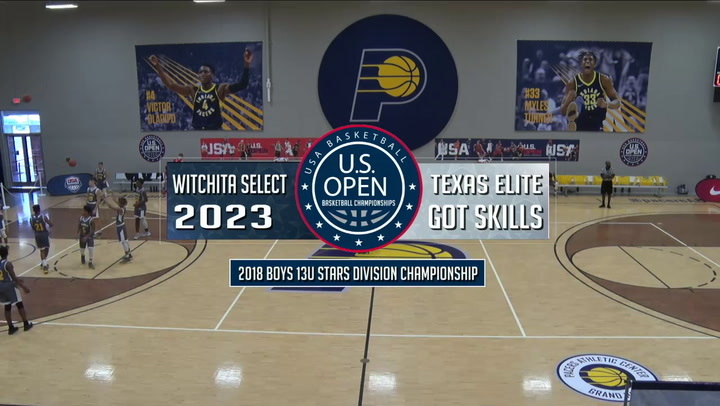 The U.S. Open Basketball Championships 13U Stars Division is down to two final teams, 5-0 Wichita Select 2023 and 4-1 Texas Elite Got Skills. Championship tip-off is slated for 12:15 p.m.
Wichita Select advanced by knocking off previously undefeated Reading KTB 43-37, while Texas Elite Got Skills beat Grand Park Premier Red 2024 57-48. The championship of the Stripe Division for the 13U boys will see Swish Basketball Chicago (2-2) meeting Primetime Performance (2-3) in a 12:15 p.m. EDT content. Earlier Saturday, Swish slipped past Pentagon 45-40, while Primetime Performance upended Breakthrough Bulldogs 58-44. Undefeated AL Southern Starz 2023 (5-0) will take on Tree of Hope (5-1) in the 11 a.m. EDT girls 13U Stars Division, and Wisconsin Shooters 2023 (2-3) will go against Katy Rebels 2023 (2-3) in the 12:15 p.m. EDT Stripe Division title game. Tree of Hope won a pair of games to advance to the finals, defeating IGB Hoover 52-32 in a play-in game, then stunned Exodus NYC 2023 in a 58-57 thriller, while AL Southern Starz came out on top of its game versus 24/7 Elite, 73-61. Owning a spotless 3-0 record, MBA Hoops from Mississippi is the team to beat in the U.S. Open Basketball Championships 12U bracket and will take on D School Elite from Washington D.C. (2-1) in the championship game. Illinois Predators Elite defeated Bakerhoops All-Stars 63-61 Saturday afternoon in the third-place game. The unbeaten New Mexico Dogs (4-0) will battle Indiana Girls Basketball Holman (3-1) at 11 a.m. EDT for the Girls 12U championship, and Colorado Springs Blue (2-2) will go against Playmaker Academy Pumas (1-4) in the game to decide third place. 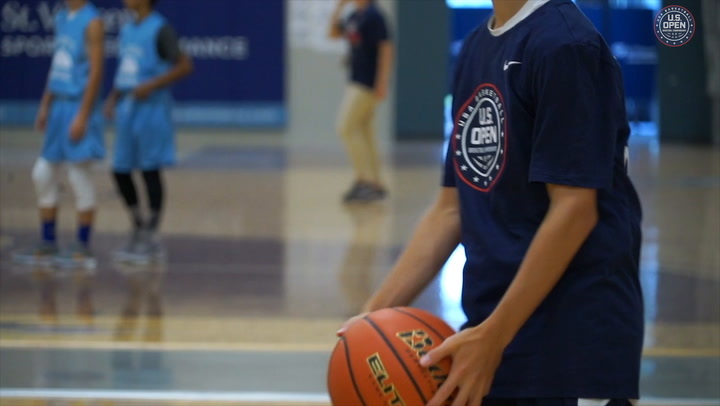 The 2018 U.S. Open Basketball Championships are a USA Basketball youth initiative that is intended to add opportunity, standards and quality to the youth basketball environment. It consists of six groups of play: eighth grade boys, eighth grade girls, 13 and under boys, 13 and under girls, 12 and under boys and 12 and under girls. 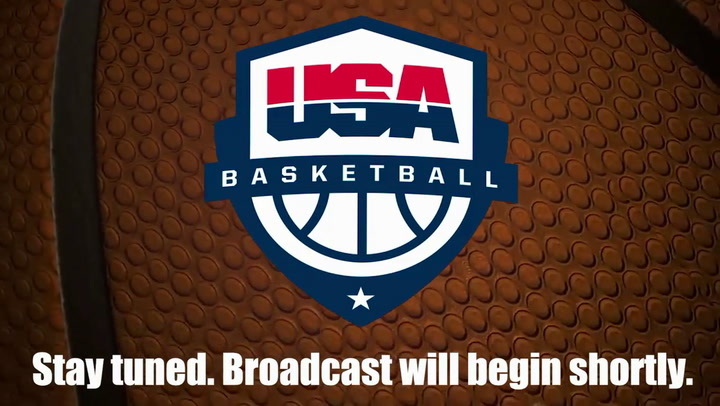 The eighth grade boys and girls gold medal games of the 2018 U.S. Open Basketball Championships live on Sunday, July 22 (12 p.m. EDT with boys following at 2 p.m. EDT). The 13U boys and girls gold medal games on July 22 will be available for streaming at usab.com/live, as well as on the USA Basketball Facebook page and USA Basketball YouTube channel.